Winds and seas have been erratic, and the NOAA forecast has often been unreliable recently. I canceled a trip based on a small craft caution and 4-foot seas prediction on Tuesday, 5/1/18, and I believe it would have been quite calm offshore, from what I saw of the wind action that day. On Thursday, 5/3, seas were predicted to be calm, but they were choppy when I headed out with Dave Carey, George Siambones, and Steve Wanner. We stopped at the near-shore reefs first, hoping for some action there so we would not have to venture into choppier waters, but there was little to no action there. We ventured out to about 6 miles and caught one short mangrove snapper and one short lane snapper. After releasing those, we headed out to 12 miles, where we caught three keeper lanes. Our final destination, 15 miles west of New Pass, yielded a couple more keeper lanes to 13 inches, along with four nice-sized grunts. So the guys ended up with enough food-fish. As for thrills, they battled and released two sharks: one five-foot hammerhead and one 35-inch sharpnose. Jayne Muschett and friend, Neil, fished 23 miles west of New Pass with me on Friday morning, 5/4. They used cut-bait and squid to catch thirteen keeper lane snapper to 13 inches, and they kept two 13-inch grunts of the nine grunts that they caught. They also released thirty-two red grouper shorts. Vince Rosetti and his son, Mike, fished 19 miles west of New Pass with me on Friday, 5/11, and did well using frozen squid for lane snapper. They boxed 26 keeper lanes to 14 inches, along with a half-dozen 13-14-inch grunts. They released a dozen red grouper shorts, along with a 4-foot blacknose shark. Lots of rain moved into the area over Sunday and Monday, 5/13 and 5/14 and, though the rain is desperately needed, it did cause my offshore trip to cancel on Monday. Tuesday, 5/15, remained unsettled, and Wednesday began with rain, but had some clearing mid-morning. 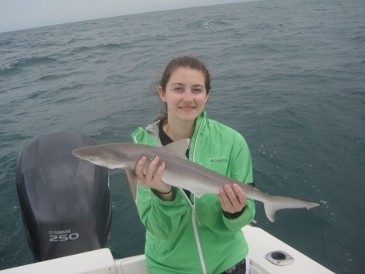 So, on Wednesday morning, 5/16, Tom Maby and his girlfriend, Allison Smith weighed their options for fishing offshore versus inshore, and decided to give the gulf a try, near-shore. The couple used squid and cut-bait to catch and release four sharpnose sharks to 40 inches, along with 22 red grouper shorts. They boxed six Spanish mackerel to 24 inches, along with five of the fifteen grunts they caught. Tom Maby decided to fish again on Thursday, 5/17. Allison had her fill of choppy seas the day before, so Tom went on his own this trip. We dodged rainstorms a good part of the morning, and got out to 22 miles from New Pass, where we used squid and cut-bait to box fifteen keeper lane snapper and a half dozen grunts. Tom released a few red grouper shorts to 17 inches. After several days of rain and stormy weather, I got back out fishing on Wednesday, 5/23, when I headed offshore 21 miles with Phil Marcianati and Reid Wisniewski. The guys used squid and cut bait to land a dozen keeper lane snapper to 17 inches. They released two dozen red grouper shorts to 19 inches, along with five 14-inch triggerfish and a 36-inch sharpnose shark. John Teichgraeber and his mom, Heidi, fished the backwaters of southern Estero Bay with me on Friday morning, 5/25. They used live shrimp to box a 21-inch redfish, three keeper mangrove snapper, and a 13-inch sheepshead. They released four short sheeps.